With the release of Descent into Darkness fast approaching, it's time to preview some of the cards that could have a major impact in the post-release meta. 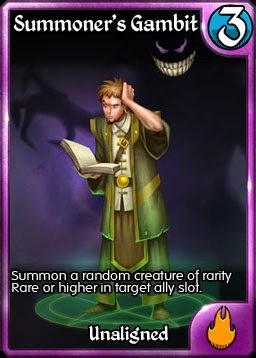 Gaining control of an opposing creature has so far only appeared on one card - Fae Charm - which remains a tournament and Guild War staple. The Elemental Kingdom isn't as subtle as Mystical though. They steal your creature, have it smash you in the face and then blow it up. 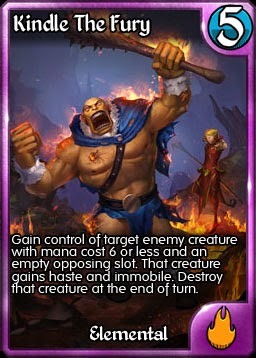 Where Kindle The Fury really shines is stealing creatures with "On Attack" and "When this deals damage" creatures, where you can immediately have that creature attack back, trigger their ability and then have that creature destroyed. Fire bolt on a Scavenging Goblin may be cheaper, but using Kindle the Fury is far more rewarding. Note that have the creature destroyed on your side has added benefits. Steal a Maelstrom Phoenix, and not only will you be denying your opponent the chance to resurrect it, you will be able to resurrect it yourself on your next turn for additional damage. Arguably the most powerful card in the game that does nothing on its own. Originally designed with a mana cost of 3, this relic was debated long and hard amongst the Beta team. It was redesigned, retested, and then ended back with its original text but an added mana. 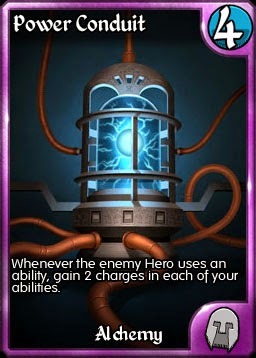 Power Conduit creates a difficult mental challenge for your opponent. Unlike Diryam, your opponent can use their abilities all they want. But if they do, you will gain up to SIX charges - an effect that can quickly get out of hand if not respected. Of course a smart opponent does have options to playing around this powerful effect. If your charges are all one off full, giving you the extra charges is no different than just passing the turn. And there are times where using an ultimate or other powerful ability is just too critical to use, and triggering the conduit is a risk worth taking. But in the long run, forcing your opponent to play these mind games can give you a significant benefit in a hard fought game. Note that from a timing perspective, the ability resolves first, so Ravinova and Bahamut can destroy the Conduit with their middle abilities and you will receive no charges. Yes, that says what you think it says. Any "On Your Turn", "On Enemy Turn" or "On Each Turn" effect simply will not trigger. 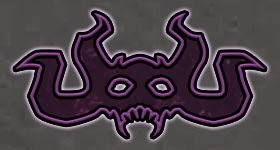 Now this can be used to turn off opposing Lava Blades, or turn off the negative effects of your own Spiteful Demon or get all of the gain, and none of the pain, from Tainted Amulet. And this never-before-seen ability comes of a solid little body - a 2/2 for 2 with a touch of Resist to keep him from being Disintegrated away. Finally we have Eye for an Eye, a personal favourite, that gives new life to those creatures with high HP. Again, Eye for an Eye does nothing on an empty board, but can make decisions for your opponent very difficult. Say that you and I have Dwarven Battle Rigs in a stand off. One tactic is to use a Disintegrate to knock your Rig down to a 2/2, so that if you attack, you'll lose your rig, while mine will still be on the board. With Eye to Eye in the game, this becomes a risky play. I can play Eye for an Eye and deal 4 damage back (my Rig's maximum HP) and attack through unopposed. And damaged creatures can be used to kill any creature on the board simply by moving it over first. In a recent game on the Beta, I had a Drillspiker in play (a new 1/5 unblockable construct) that had been weakened and damaged down to a 0/2. My opponent, playing a Bahamut Fae deck, dropped a Fae Paragon and pumped it with Dragon Form, making a 4/4 Flying, Resist, Intimidating monster. With one mana and an Eye for an Eye, my damaged Drillspiker dealt 5 damage to the Paragon sending it crashing out of the sky. So there you go with a few of the new effects found in Descent into Darkness. In our next blog post we'll finally reveal the new Legendary creature, a demon who will end more than a few games all by himself. When designing Light Ascending, I had a simple idea: make a cycle of low mana spells that got better if you played them using a hero from the same Kingdom. I designed all six, but chose to put only three in LA and saved the others for Descent into Darkness. To my delight, all three of the Light Ascending charms have found homes in competitive decks. Holy Charm has arguably been the strongest, giving Akatril and Belnir a much needed boost and made Justice-based decks a Limited-format wrecking ball. Ancient Charm had a similar impact, sending Bahamut soaring, particularly in Limited. With Ancient heroes locked out of the Rejuve Potion parade, Ancient Charm filled in that slot nicely. Elemental Charm appeared in fewer decks, but as a 1 mana spell capable of taking out two small creatures in one shot, it remains a solid option. 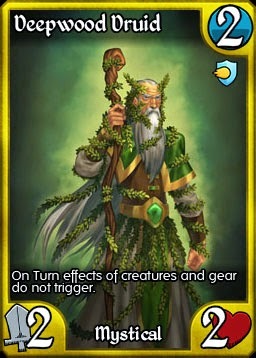 We can now reveal the new Charms - three new commons that could have just as much impact as the rares in the new meta! Masters of abilities and purveyors of poison, the Alchemy Kingdom's charm is a potent removal spell for creatures of all sizes. Does the opposing creature have Regen? Puresoul? 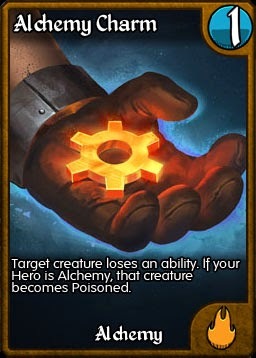 This charm removes the ability first, then applies Poison to wear them down. While the death may not be immediate, its the only Charm that can take down a Skybreaker Giant. This charm was redesigned a few times, but the final design is definitely the best. Subtle in its ability, this may be the best Charm to be played by any Kingdom, as making a two point attack swing is a strong move for a single mana. 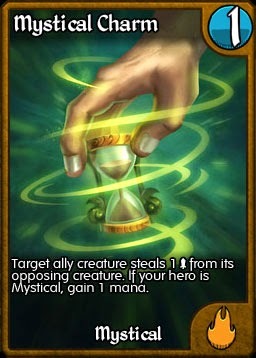 Mystical heroes simply get the added benefit of getting that mana back for the result of a free targeted Dwindle. This spell was originally a simple targeted "creature loses 1 HP, your hero gains 1 HP". Our beta testers were not impressed and this design was suggested and tested in its place. The new design it very powerful, particularly in multiples. Hit with two on a sacrificial lamb and you have a 4/4 for 2 mana. 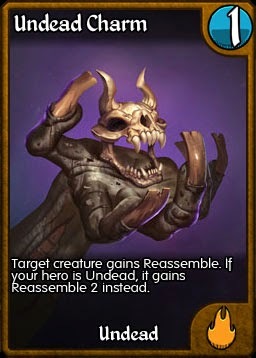 Not to mention that Descent into Darkness also includes the best Reassemble creature ever released for you to feed the charms to. Perhaps Ardent Purifier will find a home after all. Stay tuned for more previews coming soon! 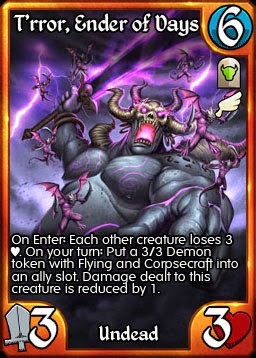 Descent includes 55 all new cards, skewed heavily towards the Dark Alliance - Undead, Alchemy and Elemental. 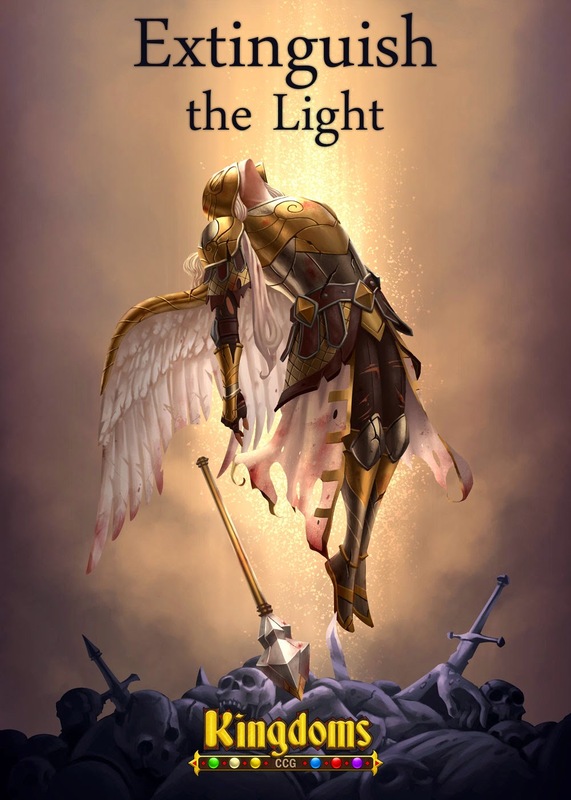 Surprised by appearance of Elara and the armies of Knights, Giants and Fae that she inspired, the Kingdoms of the Dark were forced to call upon their own champion - a demon of such unyielding power that it threatens not just the forces of Light, but the very existence of Euna. 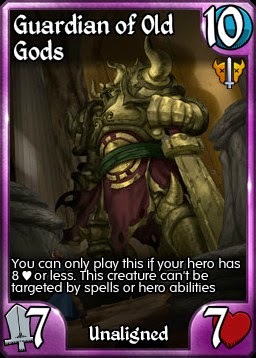 Untargetable, and effectively unblockable, "GooG" has been killing players for years. His limitation text ignored using cards like Swap and Dreadful Return, a lucky player could have a GooG bearing down for the kill as early as the first turn. Final Verdict is the untargeted solution to the most powerful threats in the game, today and in the future. 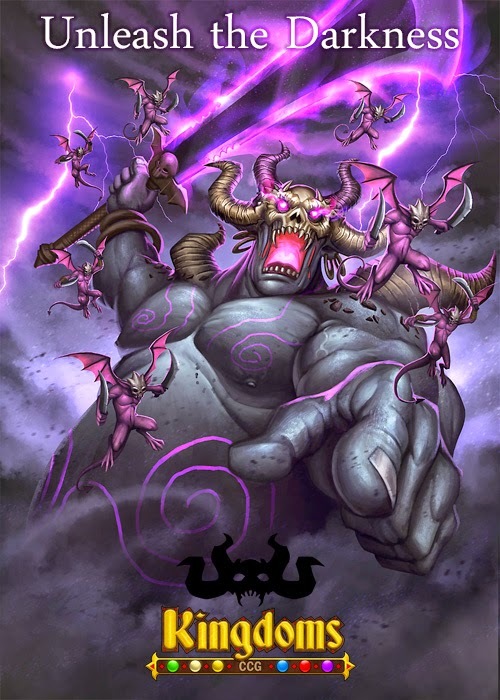 Yet while it can clear the board of a Skullcrusher Giant or Bruiser from Beyond with ease, it is balanced by the fact that a buffed and empowered Swiftshot Ranger will ignore it fully, and that while you may need to kill that Diryam right now, if your opponent also has out a Dwarven Battle Rig, Final Verdict won't help you. 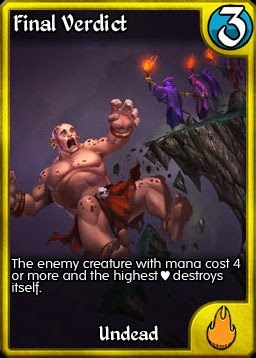 Stay tuned to the blog for more card previews. Descent into Darkness will be hitting the shop in just two weeks time! 1) Our new dynamic market code is up. Card prices will no longer be subject to wild fluctuations and will more accurately reflect the impact of the card on the current metagame. 2) Epic Cards now have a dynamic price range. 3) Tribes cards have been moved to the same price range as Eve and Rise. 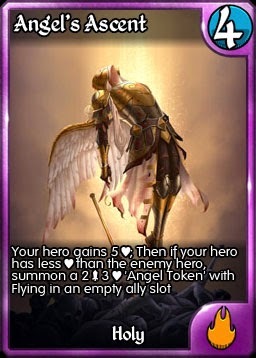 4) Light Ascending singles have been added to the Dynamic Market for the first time. If you're looking for those last few cards to complete your set, now is your chance. 5) Bug Fix: Token creatures that gain Reassemble will no longer go to the discard pile. 6) Bug Fix: When a Corpse is destroyed by a creature with Corpsecraft coming into play, it will go to the discard pile instead of being banished. 7) Bug Fix: Warrior Remnants now works properly when destroyed by an ability like Uunys'. 8) Bug Fix: A Rotfeeder that has been granted Reassemble 4 by his ability, will now properly become a 4/4 Skeleton when destroyed by an ability like Uunys'. 9) Bug Fix: Mind over Body is now working properly. 10) Mind Fly and Plague Beetle now have the subtype Vermin in addition to Insect for nefarious reasons. Today we have some exciting news. This Wednesday we will be finally releasing our new, recoded Dynamic Singles market system. 1) Epic Cards will no longer be fixed cost. They will have a range of prices just like the other rarities. 2) Tribes singles are being moved to the same pricing model as Eve and Rise. 3) Light Ascending will be added to the Dynamic Singles market. You read that last one right. For the first time, Light Ascending will be available for purchase outside of booster packs. Later this week we will be making the official announcement for the new set, with its final name and our first few preview cards. 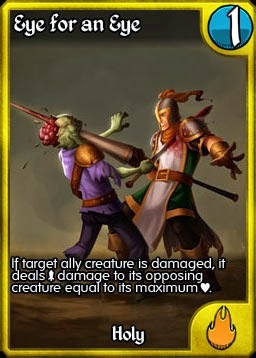 an Uncommon with the text "Opposing creature cannot attack"
As you can see, we are watching the meta and continuing to make cards that directly address holes in players' arsenals. We are currently in development on some exciting changes to the Arena. We have been reading the forums on how to improve the game and many of you have come to the same realization that we have: to make the game better, we need to have a really great PVP arena. 1) Encouraging you to play LIVE PVP games. To prove that you're the best Kingdoms player, you should have to beat other actual players, not an AI playing another player's deck. 2) Rewarding you for playing those PVP games. The Challenges are a nice start, but driving up the PVP ladders need actual rewards as well, and soon they will. 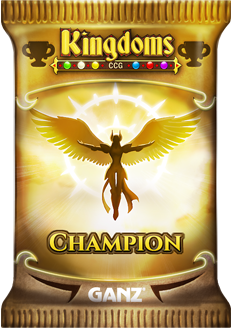 Spring is here and as the weather warms, things will start to heat up in Kingdoms CCG!